Lords of Creation was a table top role-playing game published by Avalon Hill in 1983 and 1984. 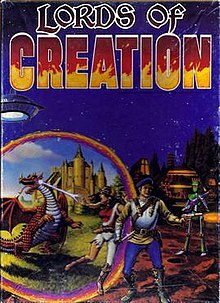 The game was written by Tom Moldvay who also worked on the games Dungeons and Dragons and Star Frontiers. Lords of Creation was not set in a single genre but was designed to allow players to play their characters through scenarios in settings varying from fantasy to science fiction to modern espionage. Characters gained powers and skills as they progressed, including magical abilities and high tech cybernetics. Their progression leads to demigod status, the character becoming a "Lord of Creation" with the ability to create their own pocket universe. The game broke the fourth wall, encouraging players who had advanced their characters to Lord of Creation status to then in turn take the role of gamemaster, refereeing the game in their character's pocket universe. The game came in a box containing the rulebook, the Book of Foes (containing statistics for creatures to fight, historical figures and examples of other Lords of Creation), and dice. The Horn of Roland was an introductory adventure, the beginning of which is set in a science fiction convention and eventually leads to the Bermuda Triangle. The Yeti Sanction was set in the 1980s (modern day at the time of publication) and involved the characters tracking down the kidnapped Secretary of State. It also came with a GM screen and the scenario included expanded rules for cars, vehicle modification, vehicular combat, and chases. Omegakron was set in the future, after a nuclear war in the city of Akron, Ohio. This module also came with a pad of blank character sheets for the game. Two other adventure modules were announced, The Tower of Ilium and The Mines of Voria, but were never released. The game was reviewed in Steve Jackson Games Fantasy Gamer issue #6. Reviewer Warren Spector described the game as "...hopelessly mediocre--good at some things but great at none." This page was last edited on 25 April 2019, at 20:01 (UTC).